This is the third of my reports on HS2. The previous was made in May 2018 thus four months has elapsed. 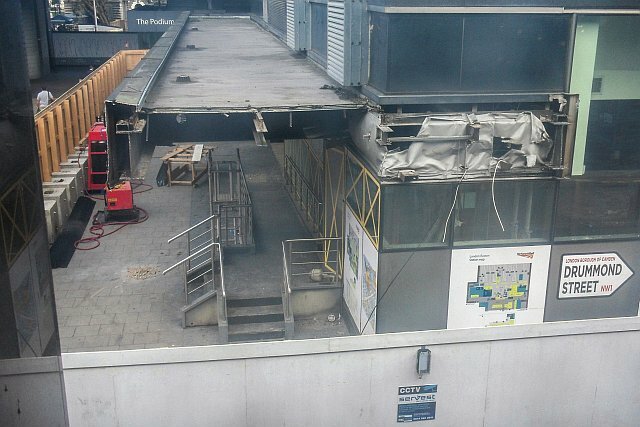 HS2’s progress is quite well underway with some demolition already having taking place. The earliest structure to be demolished was Euston Downside Carriage Maintenance Depot in Park Crescent West/Granby Terrace. Its not completely finished as there is still a part of the building enveloped in scaffolding alongside the running lines. This bit, rather more of a retaining wall, has to await diggers because the depot was in fact built on an embankment to keep the tracks level. 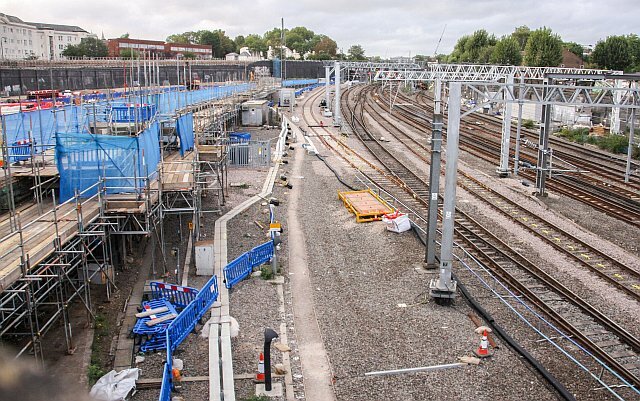 The site will ultimately become the location for six new tracks out of Euston. 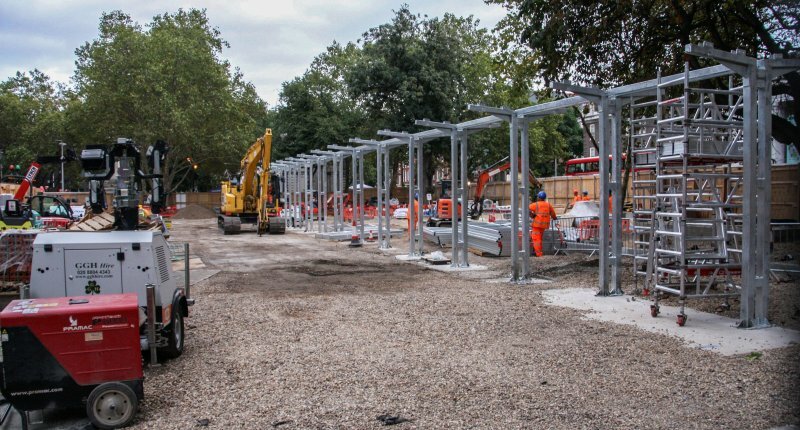 These will leave the station and pass under Hampstead Road via a new bridge, before dropping into tunnels alongside Park Crescent East. The reason for this quite long post is one was prepared in August however due to circumstances it was not completed and just slipped by. 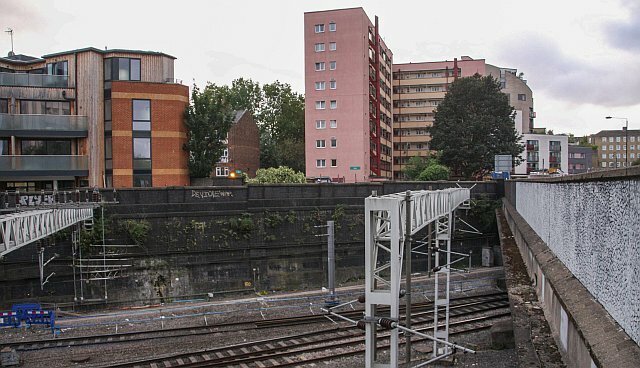 Before we move on, the feature image shows the former Red Star parcels depot at Euston. I wonder how much longer that old Red Star parcels sign will stay? 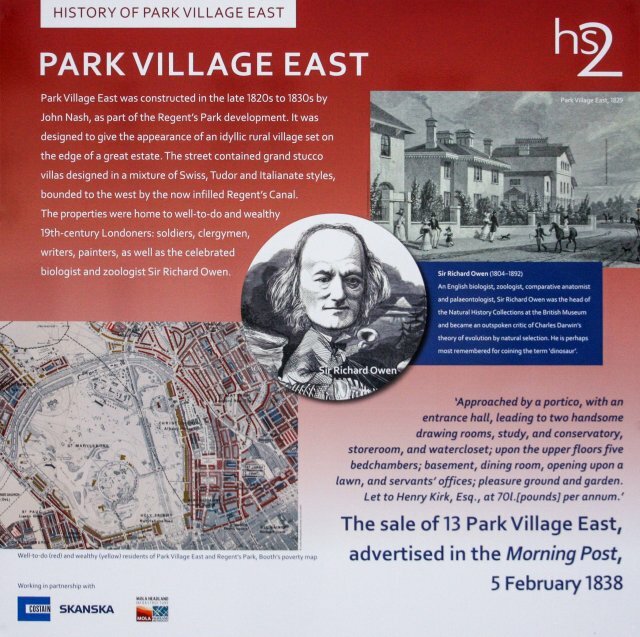 Its bound to disappear as HS2 progresses… Next is a look at what has been happening at Park Village East/Granby Terrace. View south along Park Village East where the Granby Terrace depot once stood. In its place are these hoardings with a number of information boards, all of which are reproduced below. 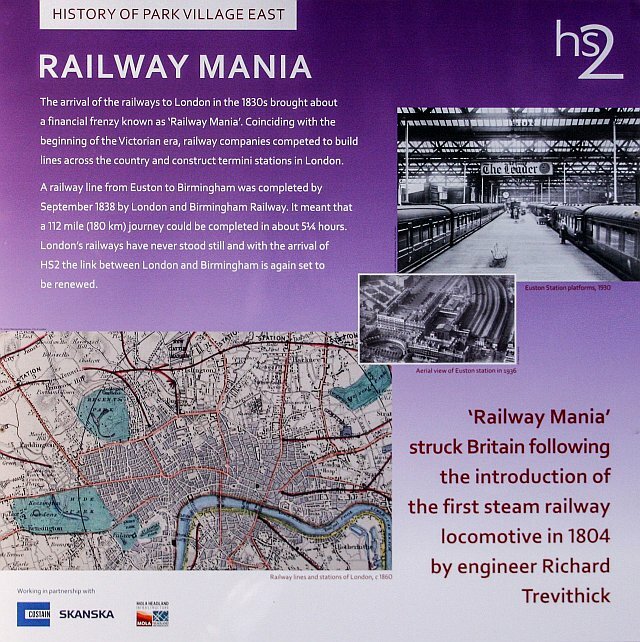 Railway mania – From Penydarren to Euston! 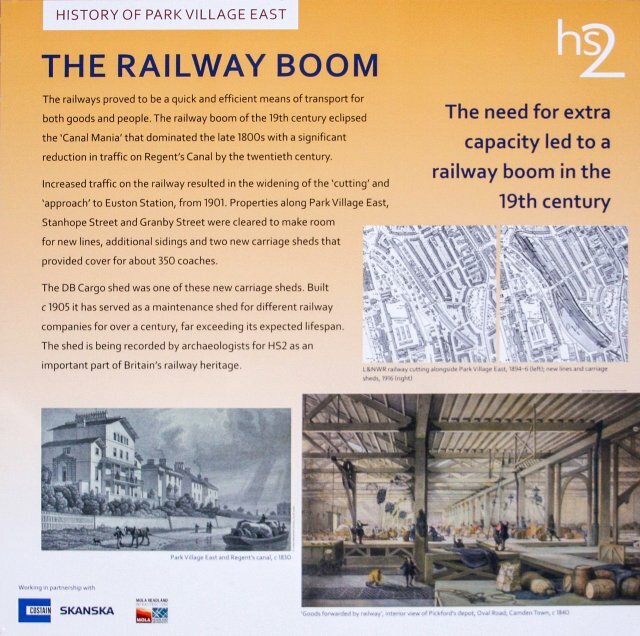 ALL the information boards that have been made so far (including those not used now) can be seen at the HS2 information centre on Hampstead Road. 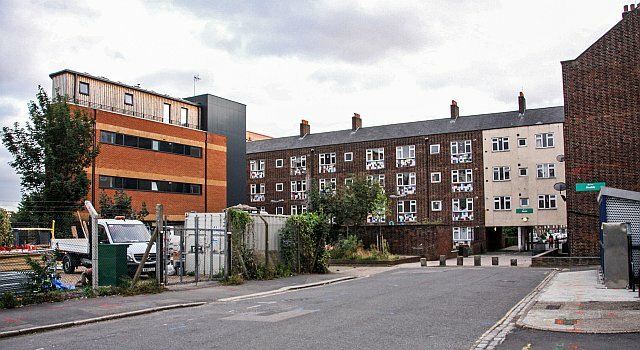 As I understand, the buildings to the west of Hampstead Road (and south of Granby Terrace) will be demolished. Not all of them only those affected by the HS2 alignment. This section will ultimately become what are the end of the platforms. 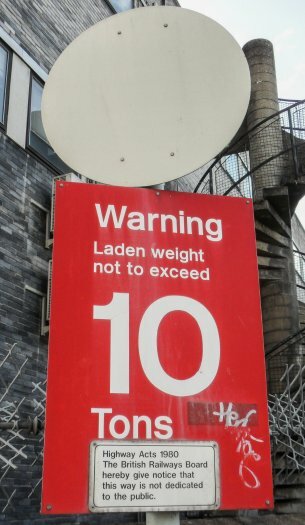 These will be at a much lower level than those existing. Immediately beyond the HS2 platforms eleven tracks will merge into six and these will pass through a new tunnel beneath Hampstead Road before passing beneath a short open air section immediately by the second head house. The tracks themselves will descend as soon as they leave the station precincts thus they will be quite deep. 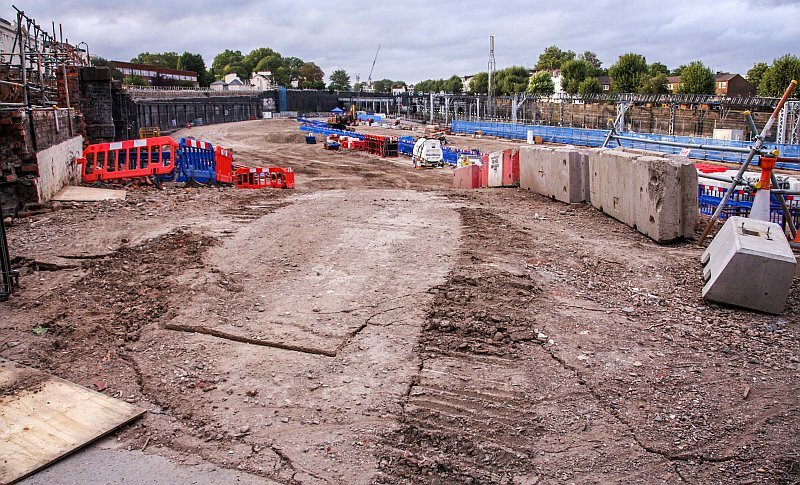 Beyond Granby Terrace there will be underground flyovers enabling trains to switch tracks uninterrupted. Its clear this bit is going to be quite stupendous even though it is below ground. At the end of these flyovers the tracks merge to a pair upon entering the new tunnels leading to Old Oak. 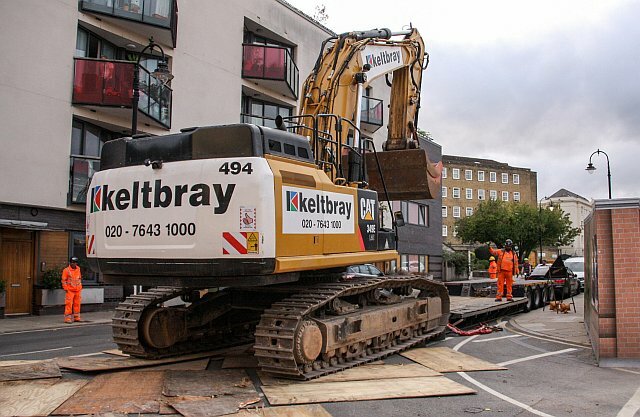 The next two pictures show what will be demolished between Granby Terrace and Hampstead Road. This work is needed to enable construction of the new lines out of the HS2 terminus, as well as a new tunnel underneath both roads. The same building, this is the one with the yellow stripes, can be seen in both views. I think from this point onwards, this is late September, the construction people will start focusing on the Drummond Street area. 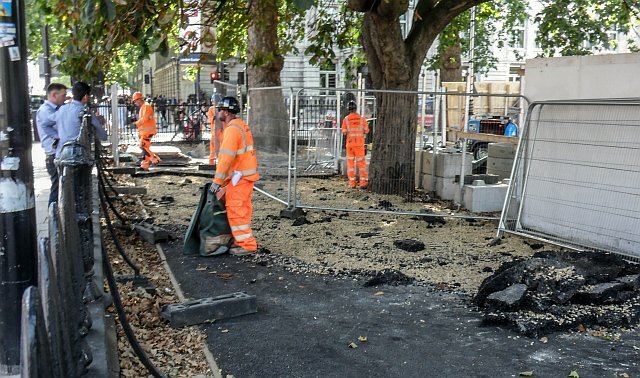 Certainly there has been a number of things happening in the past few weeks in preparation for this – new pedestrian diversions and more roads closed off. 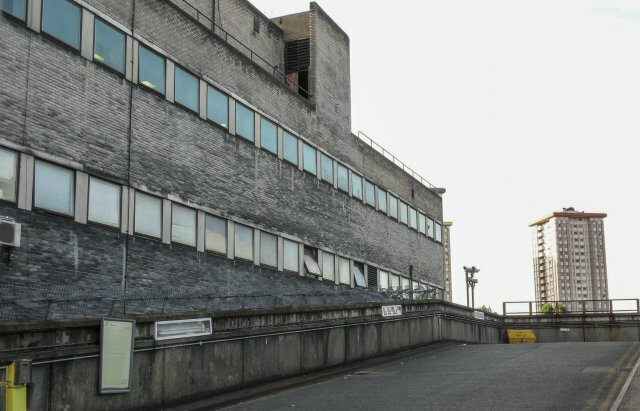 I have been assured that by October they should start knocking down the Calumet buildings and later in the month the the old Hampstead Tube station buildings will be taken down to the ground. Originally that was supposed to occur at a somewhat later date but it seems they have brought it forward as the area around the building is now being closed off which means of course the old tube station tours can no longer even use this bit. This page shows the plans for a replacement tube sub station and vent shaft somewhat further south away from the Euston HS2 site. These two pictures show the changes on the east side of Hampstead Road from roughly the same viewpoint. It may not be obvious however in the distance can be seen a light coloured brick building, its that alongside Cardington Street and was once the Ibis London Euston Hotel. In the first taken in August little has changed. That below, taken in mid-September, shows quite a bit of progress. The building on the right is now covered in scaffolding. What is more important is this huge hangar being built on the site of St James Gardens. This is in fact a tent (a big one!) intended to cover a large part of the St James Gardens (the former burial grounds at the west side of the present station) so that archaeologists can conduct investigations. That site will eventually be built upon with the new Euston station. It is said there are more than 60,000 bodies in the burial grounds and all of these will have to be exhumed and re-located. 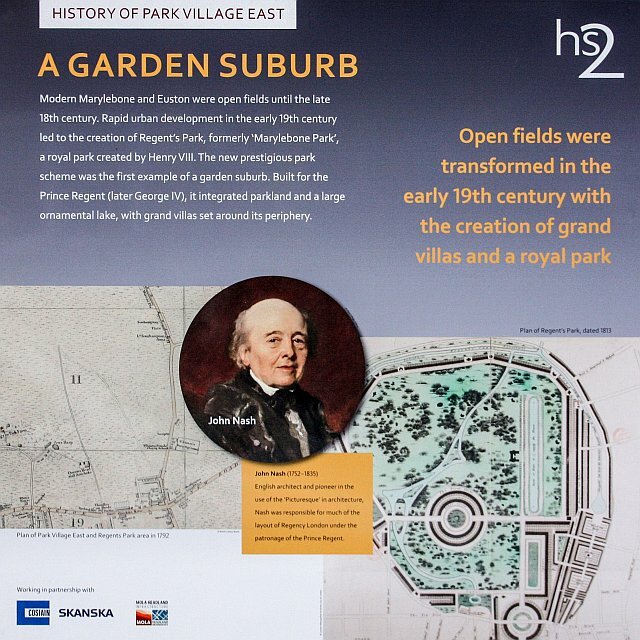 HS2 have said that “The first stage of the work involves archaeologists undertaking initial ground investigations to further their understanding how the burial ground was used over time. After that, the detailed approach to the investigations in the burial ground will be developed. We expect to finish all the archaeological work in the gardens by 2019.” Details. It must be said the original proposals had intended for demolition to begin at the Calumet building in July 2018. 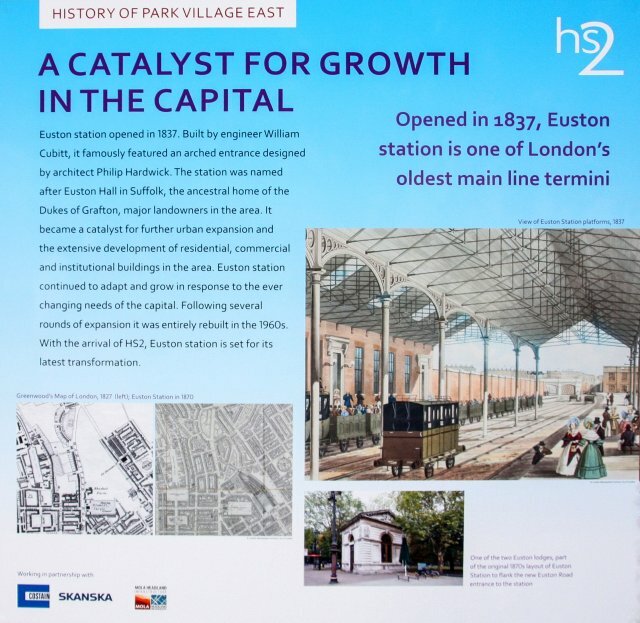 As it now stands this is due to begin October and I have pointed this out in my other two Euston HS2 posts. This is much like the new taxi rank, the plans are constantly reviewed and so any previous dates touted may not actually reflect current refined plans. One reason for this shift could be the old tube station. As I have indicated in earlier posts this was to take place much later, but it seems pointless to just leave it there whilst everything else was being demolished around it! The refinement here could simply be a compression of the timescales needed to undertake these demolitions (or new builds eg the taxi rank) and therefore constitute a better use of resources. Thus it explains why the old underground station buildings are being demolished earlier than previously planned. 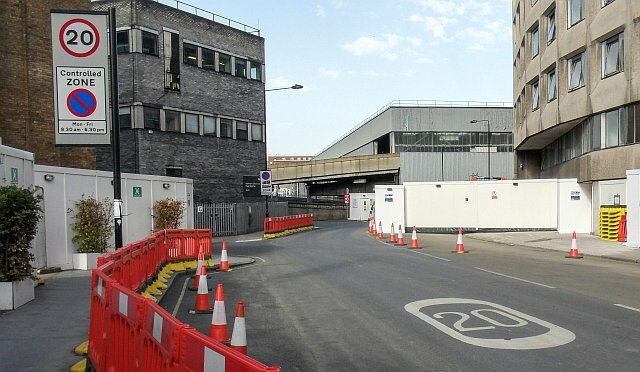 In terms of the buildings on the northern section of Cardington Street, many changes are to occur over the next few months. Whilst it was previously possible to walk down here, public access has been blocked off since about early September. 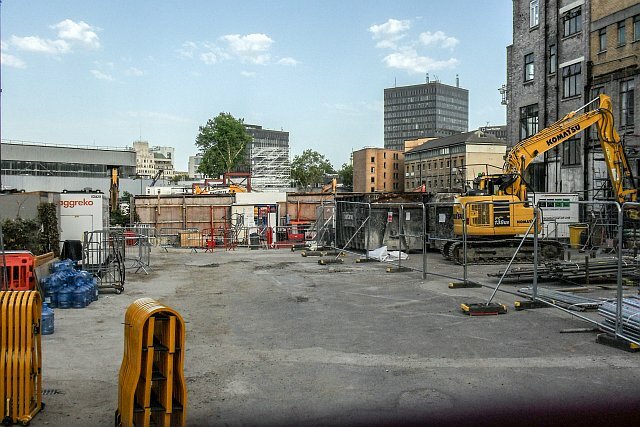 In consideration of further timescales, the west side of Euston station is where most of everything between the station and Hampstead Road is being demolished. As I have indicated work will begin in October 2018 at Drummond Street. The other bits much near to Hampstead Road on the old Cardington Street alignment will be tackled round about November with those on the north side of Cardington Street commencing in December. 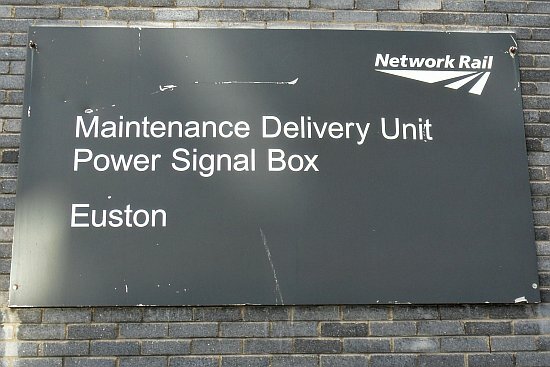 The old Euston Power Box will however stay up until about March – by then its demolition should begin. The lateness of that may be due to the power box still having essential equipment that is used to control the station remotely. Whilst Network Rail have done a lot of preparatory work (including line closures this summer) it seems in order to allow the power box to be demolished, some enabling works have to be undertaken later this year including track changes and further signalling modifications. 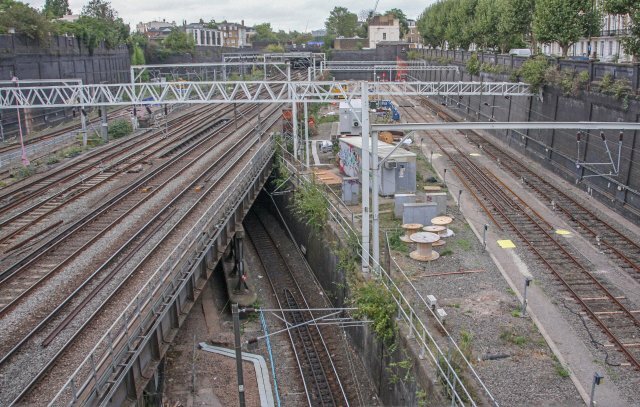 ‘Line X’ (the one that passes underneath the main lines to allow trains to pass from the east side of Euston to the west side for the fast lines) is to be removed for a temporary period whilst HS2 gets underway. I think its up to that point some of the equipment within the old power box is still required. Once the above changes have been fully implemented, this means Rugby Rail Operating Centre can assume control of Euston station from Wembley. When this has been done the Euston power box can be considered surplus to requirements. Wembley will however still be needed to control the DC lines until 2020 when that job is also given over to Rugby ROC. Old British Railway Board sign by the power box! Around Euston station itself some partial demolition has already begun this is part of the canopy to 1 Euston Square. Its not the start of the main demolition but an interim move which I think is intended to give contractors’ equipment more room to move – especially as there isn’t much room and people will need be able to access Euston station from the Melton Street side for a few more weeks until the new taxi rank is finished, which then once again the main access will be via the new taxi rank area. This means preliminary work can begin to demolish the two towers on the west side. 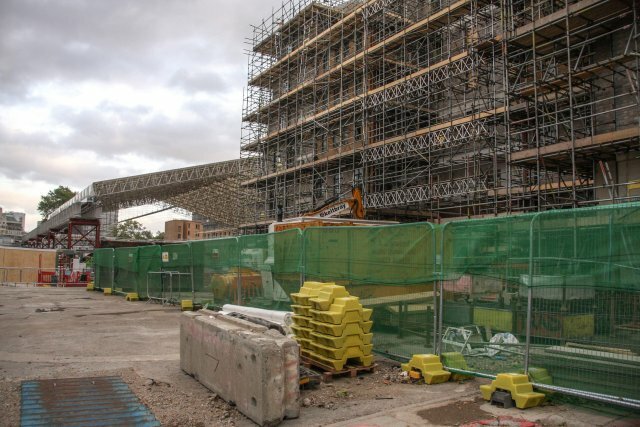 These towers are going be quite a slow job because the station areas (and the new taxi rank) immediately adjacent will need to be kept operational and safety will be a major consideration at all times. You saw it. Now you dont see it. The canopy has gone! 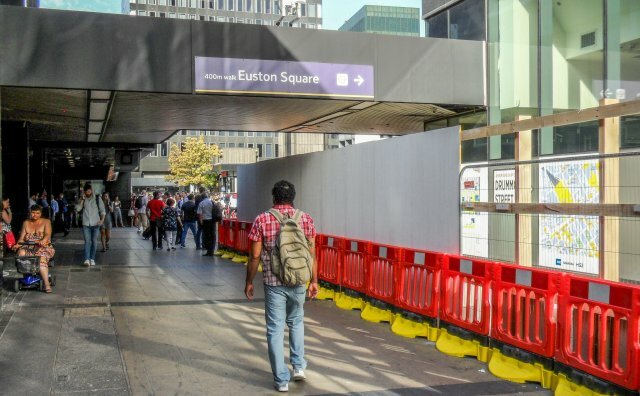 In August the temporary walkway around the south side of Euston Square was removed and a new one provided on the north side of the square. passing almost right by the Paolozzi sculpture, which still exists on site and is presently behind hoardings and covered up. This walkway will disappear when the new taxi rank comes into use, probably around October. The new, temporary taxi rank is well underway. The shape of it is already becoming quite obvious. The supports for the new stands and canopies can be seen and I think by mid October it may be completed. According to planning documents it should have been up and running by now so I think its about six weeks behind. But who knows, the plans may have been moved back for some reason and its actually on time! 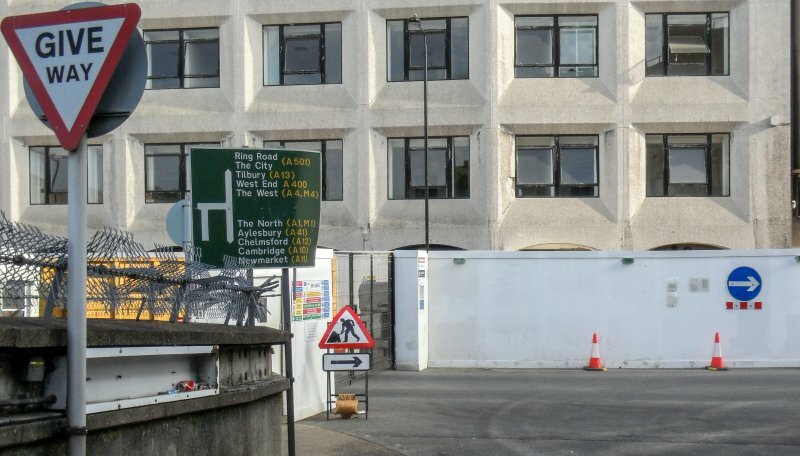 This taxi rank on the site of Euston Square Gardens will be in use until 2022 when it is moved to Eversholt Street for 2023-26, and finally Coburg Street for 2026-33. The latter is interesting because this is when the first of the HS2 services are due to start. 2026 is intended to mark the end of HS2 phase 1 and services to Birmingham will begin. 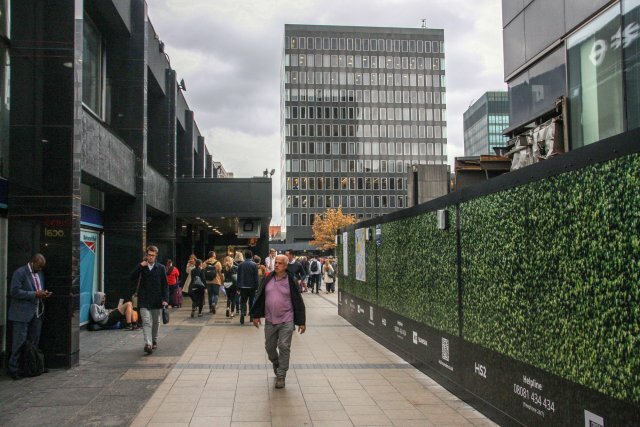 Following is phase 2 which ends in 2033 and completes the full new Euston station build – and the full complement of HS2 services should then begin – including those to Leeds and Manchester. Not really relevant to Euston HS2 itself, however something I have noticed about the HS2 plans is the canal feeder from Ruislip. Even though this is no longer in use (it has been disused since before the second world war) the HS2 plans requires a new channel cut from the the point where the feeder itself and the adjacent public footpath pass beneath the Chiltern lines in a tunnel. The footpath will be diverted I think to go over the Chiltern Lines (I cant see exactly from the drawings) whilst the canal feeder route will be diverted alongside the Chiltern Main line to fall into the River Pinn itself. This is obviously necessary because the canal feeder at least still performs a local drainage function for the West Ruislip golf course and open area. Sadly it means the somewhat exotic walking route alongside the feeder through these tunnels will no longer be available at some point in the future. For those of us interested in how HS2 work is progressing, this sort of reportage is appreciated.